Bodegas Faustino is located in Oyon – Álava in Rioja, Spain. It enjoys a well-deserved international reputation after more than 150 years of experience in the production and aging of premium wines. The winery has 650 hectares of vineyards in the heart of Rioja Alavesa, between Laguardia and Oyón villages (in the North of Spain). The fourth generation family business, has become a leader in the production and exportation of high quality wines. The names of Bodegas Faustino wines are simple, just Faustino and something and usually something is number. The smaller the number, the better the wine should be. Winery produces red, white, rose and cava wines. Tasted wine was Faustino I Gran Reserva 2001, which costs in Alko 24,90€ making it obviously upper shelf wine. Wine is produced from Tempranillo, Graciano and Mazuelo grapes. I means that it should be the best of this Faustino red wine series. All Faustino bottle lables have same style and all Faustino red wine bottle labels have some traditional figure on them. 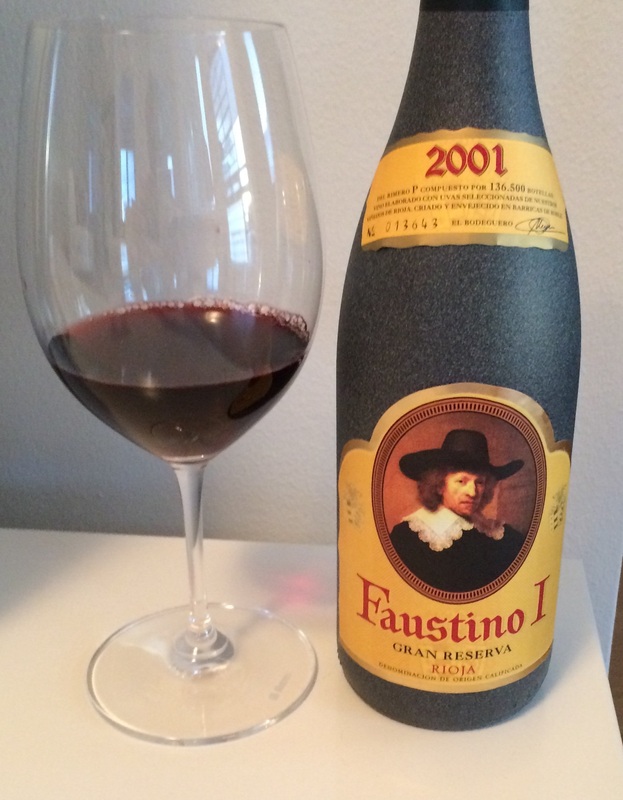 Faustino I 2001 was dark red but although it had some age already, no brownish color. Pleasant and rich aroma without surprises. Medium-bodied, aromatic but somehow lackluster flavor. Expected a little bit more after reading some of the tasting notes from professional wine sites. 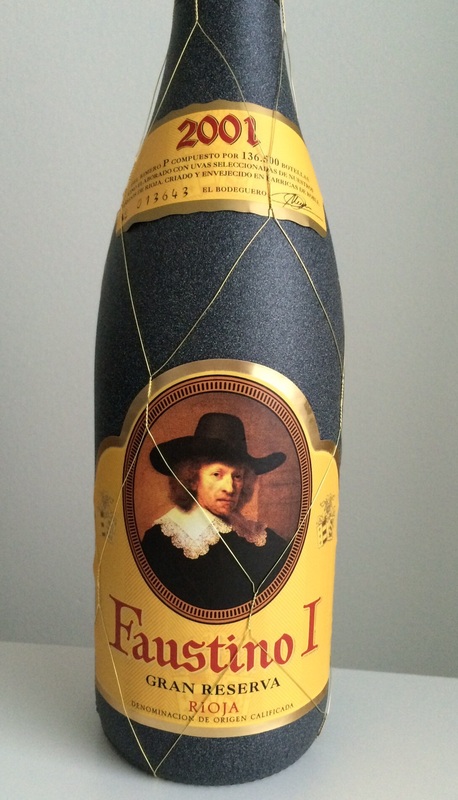 Tasted Faustino I first as such and that gave an impression of little bit lackluster flavor. To be honest this wine has not enough boost for red meats. But with blue cheese it paired extremely well. 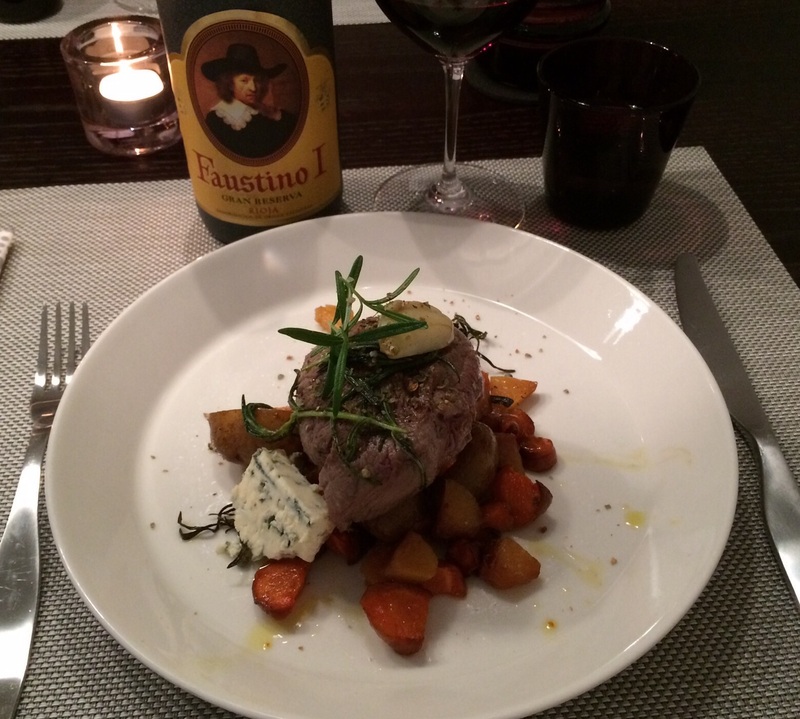 Therefore recommend to enjoy Faustino I, at least 2001, with white meats, game birds and cheeses. Cheers! Love this post! I am inspired to return to Spain soon! Thanks for comment! Spanish red wines are my favourites, especially Aalto, which is Finnish name and winery name is also bodegas Aalto. BTW, your blog is protected. Is it on purpose or something wrong with settings? That works fine! Did you have another site address? Very nice review of this Rioja. Thank you for sharing. I second Anatoli’s comments, but I agree with you that even if Faustino does not shine, it is definitely “drinkable” and enjoyable in the right context. Thanks for reading the post and comments! With the price level Faustino I is sold, it should have more character. Thanks for hint! I shall try it soon if I find it from our monopoly retailer Alko. Otherwise must bring it home when travelling abroad. That specific wine might be a tough call, but you can look for the 2004 vintage as well. I recently had a number of posts regarding Spanish wines, where I share some of my favorite Rioja, so you might see what might be available from that list. Have to keep eye on that one too.